FARA ED Calls for the Modernization of Africa’s Food Production Systems Through Science at the AfricaHEWeek2016. The Regional Universities Forum for Capacity Building in Agriculture (RUFORUM) convened the 5th African Higher Education Week and RUFORUM Biennial Conference 2016 in Cape town South Africa from 17th– 21st October, 2016. RUFORUM is an institution that oversee graduate training and networks of specialization across Africa and primarily within the Common Market for Eastern and Southern Africa (COMESA). With the conference themed “Linking Agricultural Universities with Civil Society, Private Sector, the Governments and other Stakeholders in support of Agricultural Research for Development in Africa”, it brought together people from all strata to deliberate on moving forward the values of Research and Development on the continent. Speaking at the event in his good will message, Dr. Yemi Akinbamijo the Executive Director of FARA emphasized the growing dynamism of the operational context of African Agriculture. Dr. Akinbamijo mentioned that during the past couple of months, almost all major continent-wide events have sounded the clarion call on the need to galvanize all efforts and move together in synchrony to respond to the demands of the Sustainable Development Goals (SDGs), Comprehensive African Agricultural Programme (CAADP–Malabo), Science, Technology and Innovation Strategy for Africa (STISA) and Agenda 2063. He commented that “…FARA and the constituent Sub-Regional Organizations (SROs) had the 7th Africa Agricultural Science Week (AASW7) and FARA General Assembly which was a turning point in Agricultural Research, the African Green Revolution Forum (AGRF) spoke of seizing the momentum, the African Development Bank (AfDB) endorsed and out-doored its Agriculture Strategy and now RUFORUM – Indeed we’ve got more than a bee and a clover!…”. The red thread in all of these he explained, is the modernization of our food production systems using science. Further, he observed that the path of a rising Africa is the path we all tread on a daily basis; this biennial conference is but one of the few tools in our hands. Dr Akinbamijo applauded Prof Adipala Ekwamu, the Executive Secretary and the RUFORUM team for their continuous work at ensuring efficient Capacity Building in Agriculture. 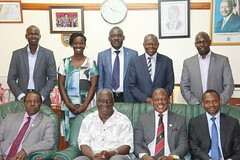 He reiterated that wearing the Capacity Development and Outreach cap of the FARA Mandate, the AfDB-supported Technologies for African Agricultural Transformation (TAAT) and the African Agricultural Research Programme (AARP) are two initiatives that will further allow FARA to continue to support the work of RUFORUM as much as it is necessary. “Africa has finally decided to take the bull by the horn by taking responsibility for the institutional and technical growth in its agricultural development. The signs of the times show a strong convergence of events too significant to be ignored”. He commended the different donors especially the Master Card Foundation that supported RUFORUM and have helped put the wind back in the sail of agricultural education. In welcoming the participants to the Future, Dr Akinbamijo said the vision seen today is a dream come true as the African Development Bank in its bid to create a game changer, is looking inwards at the continental institutions and has decided to work with them to jointly turn the tide of African agriculture in a wealth and job creation endeavor that will resonate across every country on the continent and help stimulate a new wave of agriculture-led science-based growth. These complimentary actions from the African Development Bank’s strategy regarding Agricultural transformation, Research and Development and Youth empowerment are all emerging spaces within which Agribusiness, upscaling and commercialization of technologies will shape the future of African Agriculture, he remarked. The FARA Boss said there are new initiatives and instruments of collaboration being negotiated with partners across the continent. “We have come to a point where we must understand that we are all we have got. We will as much as it is feasible put our capacities, experience and capabilities at your disposal. You can count on FARA. We will be sailing right behind you and we will ease your mind…” he concluded.